DENVER - A gun and a note was recovered near the body of Rashaan Salaam, whose was found dead in a Boulder, Colorado, park on Monday evening, CBS Denver reports. The Boulder County Coroner’s office has confirmed Salaam’s death, saying it occurred at the Eben G. Fine Park, just a short trip from University of Colorado’s Folsom Field, where his football legend began. An exact cause of death and the contents of the note have not been released. Friends told CBS Denver that he had been distant lately. Salaam played running back for the University of Colorado from 1992 to 1994, winning the Heisman Trophy in his junior season. Salaam rushed for 2,055 yards and 24 touchdowns as a junior in 1994, leading the Buffaloes to an 11-1 record, a win over Notre Dame in the Fiesta Bowl and a No. 3 finish in the final polls. 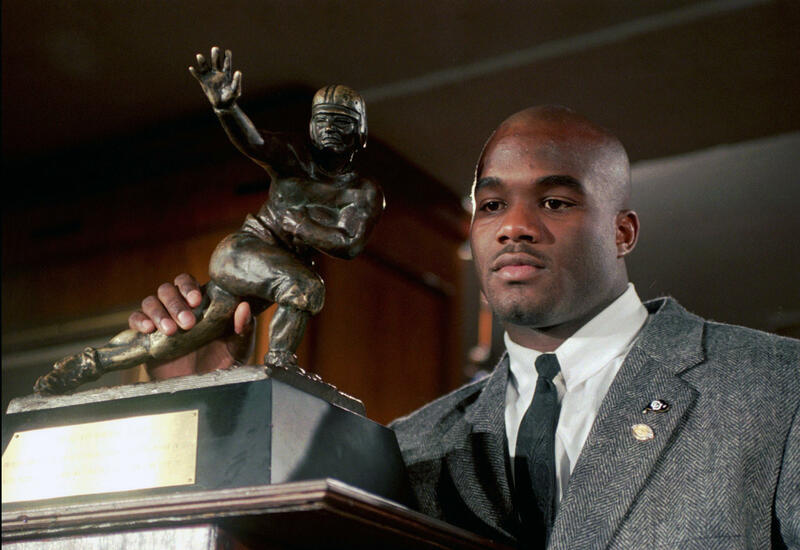 “He was so defined, I think too often by winning the Heisman Trophy and not by other things that made him a whole person, things that he loved and cared about and I think he, in fact I know he had challenges at times making that transition,” said former CU Buffs player Charles Johnson. While no official cause of death has been given, if it was suicide, Salaam would be one of several longtime football players to prematurely take their own lives in recent years. While many have linked the high occurrence of brain disease in football players to suicide, the science on the brain disease-suicide link generally says it’s not necessarily true. Salaam was one of the nation’s most prized high-school recruits coming out of eight-man football at La Jolla Country Day, a private school in San Diego. His father played freshman football at CU in 1963 before transferring to San Diego State to be closer to home. The Chicago Bears made Salaam a first-round draft pick in 1995, and he rushed for 1,074 yards and 10 touchdowns in winning NFC Rookie of the Year honors. Injuries cut short his career. He rushed for only three TDs over the next two years in Chicago and played his last NFL game with the Cleveland Browns in 1999. Salaam played for the Memphis Maniax of the defunct XFL and attempted one last comeback with the NFL before retiring. Rick Neuheisel, an assistant coach in Boulder when Salaam won the Heisman, said the play that epitomizes Salaam was the “Miracle at Michigan,” when Stewart’s 64-yard Hail Mary pass to Michael Westbrook on the final play beat the Wolverines 27-26 on Sept. 24, 1994. “All he did was create time for Kordell Stewart to get that play off,” Neuheisel said. “And if you ever see that play, Rashaan Salaam had one blocking assignment and then came back and got another blocking assignment, which allowed Kordell to kind of crow-hop up in the pocket and make the throw that we’ll all remember for a lifetime. “But there was the Heisman Trophy winner. He wasn’t just about getting the ball or catching the ball. He was about, what do I need to do for my guys so that we can have the best possible chance for success? And whether he had the ball or didn’t, it didn’t matter, he was going to go all-out,” Neuheisel said.